It was a cold and blistery morning. Minus 12 degrees (celsius) to be exact. 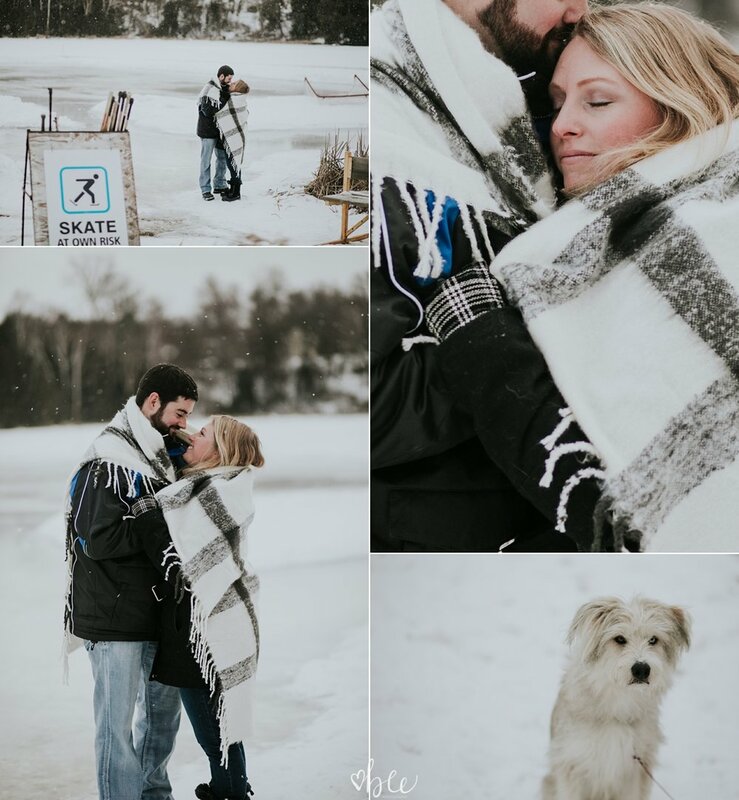 But Jenna and Rory showed up to their engagement session at Palgrave Pond with smiles and coffee and a cute dog named Rosco. This pond is the most incredible place in the winter. The Caledon firemen were out on the ice while we were shooting, spraying down the pond to make sure it stayed cold for the kids who start showing up around 9am. Driving by on a winter day gives you a real feeling of what Canada is all about. Kids outside, playing hockey on the pond, parents teaching the young ones how to skate. I always get a twinge of happiness when i drive by on a cold skating day! But this morning was all about Jenna and Rory and their love story. Jenna is an artist who I met though an online group for creatives called The Rising Tide Society. The premise is that we come together and promote Community over Competition. No competing with other local vendors but working together and promoting each other. We have a local group based in Barrie, and I am also a part of one of the Toronto groups, so if you are a creative in the area, send me a message and I can get you added to the group! I have met some of my very best friends through this group and was honoured when Jenna chose ME to be her wedding photographer! Now back to the fun we had - these two are the cutest couple ever! They laugh and play and even though Rory is a little shy, you would never know! What do you do after skating outside on a cold pond? Head to the nearest coffee shop for a fancy drink and warmth. Naturally. So we headed to the cutest coffee shop in Tottenham called Classique. Its right on the main street and delicious. If you would like more information about having me capture your love story, message me here!